The purpose of this section is to educate and inform you of the benefits and pitfalls of publishing your book. Bloated Toe Publishing was started by an author—an author with the same aspirations, questions, and fears that you likely have. He wanted to write and publish books, but didn't want to go deep into debt or give up his rights and control over his own work. After much research and thought, he and his partner decided to publish his books, and Bloated Toe was born. We've published 74 books since then, both for ourselves and other authors. Along the way, we've learned a great deal and now hope to help other authors in their quest to write and publish their books. The topics and scenarios discussed here are not meant to persuade or dissuade you in any way, nor are they meant to cut down other companies or methods. Again, the purpose of this section is to educate and allow you to make informed decisions about publishing your work. While much of the information and advice included here can be applied equally to the publication of e-books, we focus on printed books. Currently, we have the capability and tools to produce e-books, but we specialize in publishing printed books. In fact, if choosing between publishing your book in print or e-book format, we highly recommend print. While e-books have been growing in popularity in recent years, printed books remain the most popular by far, comprising roughly 75% of the overall market share. This is certainly subject to change in the coming years, but print is still king for now and the foreseeable future. Traditional publishing generally involves the acceptance of your book by a publishing company. The acceptance is based upon various factors, including the company's assessment of your book's moneymaking potential. Self-publishing may or may not involve a publishing company (such as Bloated Toe). The difference is that there isn't usually an acceptance process, or at least not one as rigorous as that associated with a traditional publisher. Typically, the author simply agrees to pay the publisher to publish his/her book. The table below summarizes some pros and cons related to traditional and self-publishing. The table represents broad generalities, and the topics in the table are discussed in more detail in subsequent sections. Traditional publishers often pay the entire cost of publishing and marketing an author's book. However, they take all or most of the profits resulting from the sale of the book. In addition, books typically go through a tedious process of reviews and changes (i.e., beyond editing and proofreading). Not only does this process extend production time, but the finished product may also differ greatly from the author's original work. Traditional publishers may also require authors to sign restrictive contracts. Among other things, these contracts may require an author to submit future books to the publisher. The question above represents a common misconception among non-authors; they simply do not realize the difference between printing and publishing. Many publishing companies do indeed provide both services, but the processes of printing and publishing are completely separate from one another. Publishing is the process required for the final book to be ready for printing. Publishing involves all the activities necessary to produce a final book with properly formatted text, illustrations, etc. Such activities include editing, proofreading, photo preparation, and formatting. Printing involves, well, printing (and binding, of course). The publisher submits a fully prepared file to the printer, and the printer puts the file's contents into the final book form. The submitted file must be formatted to the printer's specifications to ensure the final book appears as originally intended. For most books, the most important component is the text, which, first and foremost, should be carefully edited and proofread to minimize or eliminate grammatical, typographical, spelling, and other errors. Your text should also be readable. You undoubtedly have a writing style all your own, but you must also consider how your writing will be understood by your target audience. Your text will need to be formatted properly. This will involve dividing the text into chapters, placing any images at appropriate locations within the text, adding headers and footers, and much more. Traditionally, headers are comprised of the book title on the left and chapter title on the right, but this can be modified to suit the author's needs and preferences. Page numbers can be placed at the top of each page, near the outer edge, or at the bottom, either in the center or near the outer edge. The textual content is usually single-spaced, with little or no extra space between paragraphs. Chapters should begin on the right-hand side. If a chapter ends on the right-hand side, the next page is left blank. In addition, headers and footers, except page numbers, are usually absent from the first page of each chapter (this is also true for pages containing full-page images). For the first page of each chapter, the text typically starts further down the page than on standard pages (i.e., the first page of each chapter has a larger top margin). All professionally produced books, especially those intended for sale, should have front matter. This is content that appears before the main body of your book and should include, at minimum, Title, Copyright, and Contents pages. You may also wish to include additional components such as a Preface, Introduction, etc. Following the Contents page, most front-matter pages are numbered with lower-case Roman numerals (i, ii, iii, iv, ...). The main body then begins with page 1. Many books also contain back matter. This is content that appears after the main body of your book and may include an index, credits and references, etc. Like the main body, back-matter pages are usually numbered with Arabic numerals (1, 2, 3, 4, ...). Page numbering continues uninterrupted from the main body through the back-matter section (e.g., if the main body ends on page 295, the first back-matter page is 296). You will want the text in your book to be styled properly. With the plethora of fonts to choose from, it can be tempting to choose something unique to make your book really stand out. However, you must remember the most important aspect of your book is its readability. Some fonts are more readable than others. In addition, an obscure font may not be supported by your publisher or printer. If you download a font from a website, whether it's free or not, make sure you understand the licensing rights granted by the font's creator and/or vendor. You may find limits as to how the font can be used (e.g., personal vs. commercial, print vs. electronic) or whether you are allowed to embed the font in the electronic file prepared for print. OpenType fonts generally render better than TrueType fonts. If you have a TrueType font you would like to use in your book, it's a good idea to locate an OpenType version (keep in mind the licensing issues discussed above). If you require the use of bold or italics in your book, the font you choose should also exist in styled versions. 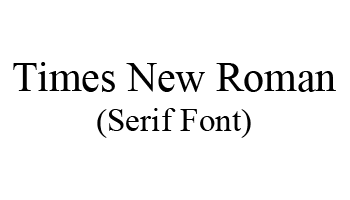 These versions will include the original font name followed by "Bold" or "Italic." For best quality, it is important that you use the correct version of your font rather than simply using the normal version and choosing "Bold" or "Italic" from your word processor's font-style menu. Printed materials, including books, generally use serif fonts. A serif is a short line, curve, or other adornment projecting from the main stroke of a letter. These lines or other additions help guide the reader's eyes along a straight line, enhancing readability. 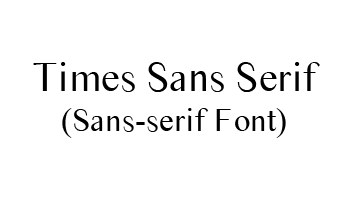 Fonts without serifs are called sans-serif fonts. These are typically used for web and other electronic media, but may be seen in print as well, especially in magazine articles and other short works. Publishing companies will have varying requirements and policies regarding how authors provide photos and illustrations. However, we will discuss some general guidelines here, the first of which is your publisher will most likely require your images to be in digital format (as opposed to snapshots, drawings, or other "hard-copy" formats). If you do not have your images in digital format, you will need to scan them. If you do not own a quality scanner, check to see if your publisher offers scanning services. If so, this is likely your best option since a publisher should be familiar with the image quality necessary for book printing. Other options include taking your images to be scanned at a local print shop or copy center that offers scanning services. If you use one of these options, make sure the establishment is capable of producing the image quality you need for your book. For printed books, images should have a resolution of at least 300 DPI (600 DPI is better both for quality and more precise sizing). If you must scan your images, make sure the scanner used has the capability of scanning at this resolution. If your images already exist in digital format, use photo-editing software (e.g., Adobe Photoshop) to check the resolution of each image. If lower than 300 DPI, your best option is to re-scan the original (non-digital) image at 300 or 600 DPI. If you do not have access to the original, use your photo-editing software to raise the resolution to 300 DPI. There is no significant advantage to having resolutions higher than 600 DPI. Resolutions higher than this result in a large file size, making the image difficult to work with and unnecessarily bloating your book's file size. JPEG files have the ability to be compressed to varying degrees to control file size. The more a JPEG file is compressed (smaller file size), the lower the quality of the image. When saving book images in JPEG format, make sure you choose the lowest compression (highest quality) setting in your photo-editing application. JPEG files should not be repeatedly edited and saved. Each time the file is changed and saved, it is recompressed, causing a loss of data, and hence, a loss of quality. If you have a JPEG image that requires extensive editing (e.g., cropping, retouching, resizing), it is best to convert the file to the TIFF format (discussed below), complete all edits, and save only the final version as a JPEG file. The JPEG format works for nearly all kinds of images, but the TIFF (file extension .tif or, less commonly, .tiff) file type is slightly better for line drawings and other images with sharper color transitions. Like JPEG, TIFF is widely supported by scanners and photo-editing tools and supports the CMYK profile. The biggest advantage TIFF offers over JPEG, though, is its ability to be edited and saved multiple times without any loss in image quality. One disadvantage is TIFF files are larger than those of the JPEG type. If you have non-digital images and a quality scanner, enlarge the image using the scanner. Generally this will produce a better-quality enlargement than that produced by resizing with photo-editing software. If you have digital images, you may use photo-editing software, but make sure the software is high-quality or professional (e.g., Adobe Photoshop). Most free applications, such as those that come pre-installed on a computer or are bundled with a digital camera, cannot produce quality enlargements. If you don't have a higher-end program, you should invest in one or check whether your publisher offers photo-editing services. We will discuss the use of color in your book in the Color vs. B&W/Grayscale section, but here we will discuss the topic as it pertains to images. If your book is destined for printing, your publisher will most likely require any color images to be in CMYK format, and any non-color images to be in CMYK or Grayscale format. Before you worry yourself too much about this requirement, check to see if your publisher will convert your images to the correct color profile at little or no additional cost. Computer screens display colors using the RGB (Red, Green, Blue) color profile, and computer applications also use this format. While many home and office color printers actually print in CMYK, they convert RGB colors from your computer applications to CMYK so there is no need for you to perform this additional step yourself. However, most book printers require images in either CMYK or Grayscale (for non-color images) format, and most ordinary photo-editing applications do not have the capability to convert from RGB to CMYK (although many do have the capability to save in Grayscale format). If your publisher will not perform color-profile conversion for you, or will do so only at an exorbitant price, you may wish to invest in an application such as Adobe Photoshop that can output images in CMYK format. Color may be used on both the cover and the interior of your book. For color, most printers use a four-color (CMYK) printing process. Black-and-white and grayscale printing is considered a one-color process because the only actual color involved is black. When considering the use of color, various factors come into play, including preferences, source images, and cost. You may wish to use color for your cover and/or interior, or you may have only grayscale images to use in your book. For many authors, however, the final decision will be based mainly on cost. As you may surmise, color printing is more expensive than grayscale printing. When it comes to covers, though, the increased cost for use of color is not usually as prohibitive as the cost of using color inside the book. Furthermore, using even one colored object inside your book will cost the same as using color throughout the entire book. For these reasons, many authors choose to use color on their covers and grayscale only throughout the interior. NOTE: Use of color adds one more complication to the process. Colored images and text created with common computer applications are usually in RGB format. Additional steps must be taken to convert these colors to CMYK format for printing. There are many types of paper available for the interior of your book. They differ in texture, color, opacity, thickness (PPI), etc. Paper may be smooth or rough and glossy or dull. Smooth, dull paper is common for books containing mostly black text. Smooth, glossy paper is better for books containing bright colors and/or many photographs. Most books use white or natural (a.k.a. beige, cream, off-white) paper, with natural usually being more expensive. Natural is the best option for books containing mostly text and intended to be read for long periods (e.g., novels, nonfiction) because the natural color is less harsh on the reader's eyes. White is best for poetry books, cookbooks, and other books that are likely to be read for short intervals, as well as for books containing more photographs than text. A paper's thickness and opacity are dependent on its basis weight. Thickness and opacity increase with basis weight, as does cost. 50# to 60# papers are common in the offset book-printing industry (these offset basis weights are equivalent to 20# and 24# office (a.k.a. bond) papers, respectively). A book's trim size is simply the size of the book. In the US, trim sizes are expressed in inches; the first number is the width and the second number is the height. Books come in an array of trim sizes, the most common being 5 x 8, 6 x 9, 8 x 10, and 8½ x 11. While a portrait (width smaller than height) orientation is more common, books can also be landscape-oriented (width larger than height). However, landscape-oriented books are often more expensive to produce than portrait-oriented books (i.e., a trim size of 10 x 8 is more expensive to produce than a trim size of 8 x 10). Choosing a trim size will depend on personal preference, the trim sizes your printer/publisher can produce, the number of pages in your book, how your book will be used, book content, cost, and various other factors. Once a book's contents have been printed on paper, the book's pages must be bound together and a cover must be added. For the sake of simplicity, time, and space, we will discuss only the most commonly used types of covers and bindings here. The two common cover types are hardcover (a.k.a. trade cloth, case-bound, hardback) and softcover (a.k.a. paperback). Choosing among cover and binding options involves many factors, including personal preference, number of pages in your book, how your book will be used, and cost. Modern hardcover books are usually case-bound. A hardcover book consists of signatures	held together by glue or stitching. End sheets (often colored) are applied to serve as the interior lining of the cover and as the first and last pages (blank) of the book. The cover is made of thick cardboard covered with paper, cloth, or other material. Hardcover books may or may not include a dust jacket (this has become less common in recent years). Hardcover books are more durable than softcover books, but are also more expensive to produce. Hardcover books generally require a minimum of 32 pages and a typical maximum of 400 pages. Softcover books are usually perfect bound, but may be bound using other methods as well (e.g., saddle stitch, spiral bind, comb bind). A softcover book consists of signatures (or sheets of paper, depending on the binding method) held together and covered by a thicker stock. While not as durable as hardcovers, softcover books are cheaper to produce and are quite popular. A perfect-bound softcover book generally requires a minimum of 64 pages and a typical maximum of 400 pages. ISBN is an acronym for International Standard Book Number. As the name implies, ISBNs are international, meaning they are recognized in all countries regardless of where the corresponding books are published. ISBNs are assigned locally, however; each country has one designated ISBN agency to assign ISBNs for publishers and self-publishers in that country. For the United States and its territories, that agency is Bowker. If you wish to sell your book in brick-and-mortar stores or online; to place your book with a wholesaler; and/or to place your book in libraries, your book will need an ISBN assigned to it. An ISBN is also necessary if you wish to list your book in Bowker's Books in Print, the main source used by booksellers and libraries to search for and order books. The listing in Books in Print contains information about the book itself, as well as ordering and correspondence information. The ISBN is printed on the copyright page of your book and on the back cover (either by itself or as part of a barcode). If you wish to release different versions of your book (e.g., softcover, hardcover, e-book), each version must have its own ISBN. This is also true for future editions of your book or if you reprint your book with a different publisher in the future. A reprint of your book that is the same as the original printing or contains only minor typographical corrections can use the ISBN originally assigned. ISBNs are typically purchased by the self-publisher or publisher and they are not transferable. Some publishers, especially self-publishers, will allow authors to purchase their own ISBNs to be used on their books. Such authors will likely wish to buy just a single ISBN, which is more expensive because the per-ISBN price decreases when the numbers are purchased in bulk. The ISBN is NOT related to the copyright. Unless specified otherwise by the book's publisher, the author of the book owns the copyright regardless of who purchases the ISBN. Some publishing companies, especially online self-publishers, claim to be Bowker agents authorized to purchase single ISBNs in an author's name at a lower price than that listed at the Bowker ISBN website. Be very wary of any publisher making such claims. Bowker does have a "Channel Partner" program, but that program has been suspended due to the abundance of publishers falsely claiming they are Bowker agents, as discussed above. Existing Channel Partners were allowed to remain as such, but Bowker is not accepting new applications. If you are considering a publisher claiming to be a Bowker agent, make absolutely certain the publisher is truly part of the Bowker Channel Partner program. Otherwise, you may pay for an ISBN that is either invalid or turns out not to be in your name. If in doubt and you really want one or more ISBNs in your name, make the purchase yourself directly from Bowker's site. In addition, make sure the publisher agrees to use your ISBN in (and on) your book. LCCN is an acronym for Library of Congress (LOC) Control Number, a cataloging number assigned to books that may be registered in the Cataloging-in-Publication (CIP) system. This system assigns bibliographic and category data used by libraries in order to shelve books properly. You will need this number if you wish to sell your book to libraries and certain other types of book dealers. The LCCN is obtained prior to a book's publication through the Preassigned Control Number (PCN) program. Only US publishers are eligible to participate in the PCN program. When a book is nearly ready to print, the publisher applies for the PCN (e-books, most books under 50 pages, and certain other book types are not eligible for this program). Once received, the number is added to the book's copyright page (preceded by "Library of Congress Control Number:"). Final determination of works selected and cataloged is made by selection librarians and recommending officers in compliance with Library of Congress collection development policies upon receipt of the printed book. Please note that while a title may receive a preassigned control number, the Library of Congress is under no obligation to provide preliminary or final cataloging information within its catalog for titles that are not ultimately selected for the Library's permanent collection. Accepted books are assigned data such as a call number and subject/category headings. They are listed in the Library of Congress Online Catalog and the book copy submitted is placed in the LOC holdings. Copyright is literally the right to copy. If you own copyrights to your work, only you can reproduce and sell it, and only you can give someone else the right to reproduce and sell it. Your copyrights begin as soon as you put your material in tangible form, so when you write your book, it automatically is copyright protected, even before you send it to a printer/publisher or register it with the US Copyright Office. You own exclusive rights to your work until you choose to give up those rights, or those rights expire according to copyright law (your life span plus 70 years, by current law). Again, copyright protection exists whether you register your work or not. However, registration with the US Copyright Office does establish a public record of your copyright claim. Furthermore, should you find it necessary to file an infringement suit in the future, your work must be registered before such a suit can be filed. Registration affords other advantages as well; visit the US Copyright Office website for more information. If nothing else, authors, especially first-time authors, may simply get a thrill out of possessing a copyright certificate for their work. A copyright claim may be filed online or by mail; the online method is cheaper. The application asks for information such as book title, author and publisher contact information, what content in the book is included and excluded in the claim, etc. Regardless of the method used to submit the claim, two (2) copies of the book must be submitted by mail (e-books may be uploaded). Receipt of the copyright certificate may take anywhere from a few weeks to several months. Errors or omissions in the application will delay the process and may even result in a phone call or email message from the copyright office seeking to clear up any confusion. Most publishers (self- and traditional) will offer to submit your copyright application for you. They may include the cost in the overall publishing price or charge an additional fee. If you're uncertain or anxious about the application process, you should spend the extra money and allow the more experienced publishing staff to take care of this important step for you. Just make sure to follow up periodically to ensure you receive your copyright certificate. All rights reserved. No part of this book may be reproduced without written permission from the author, except by a reviewer, who may quote brief passages or reproduce illustrations in a review; nor may any part of this book be reproduced, stored in a retrieval system, or transmitted in any form or by any means electronic, mechanical photocopying, recording, or other, without written permission from the author. If you plan to wholesale your book, be aware that you will most likely be expected to sell your book to wholesalers and/or distributors at a substantial discount off the retail price. These discounts are typically in the range of 40% to 60%, but may be higher or lower depending on individual retailer or distributor policies. You can read more about wholesaling your book in the Sales and Marketing section. Most traditional publishers will determine the price of your book. However, when using a self-publishing company, be sure to read its pricing policies thoroughly. Be especially careful to choose a company that allows you to determine the price of your book. Some self-publishing companies not only choose a retail price, but also choose a higher price than that appropriate for your book. This is especially true of companies that provide you with books by allowing you to purchase them from the company at a percentage discount. The higher the retail price, the higher price you pay to obtain copies of your own book. Most authors have the same goal: to sell books! And unless you're an established author with a large following (e.g., Stephen King, John Grisham), YOU must get out there and sell YOUR book. We see many publishers, especially self-publishers, make wonderful statements about how they will place and list your book in all sorts of locations accessible to buyers all over the world. Heck, many of them would lead you to believe you can just sit back in your easy chair while your book sells like hotcakes around the world and the money just pours in. Well, we're here to bring you to back down to earth. The hard part wasn't just writing your book. Now that your book is published, the really hard part—selling your book—has only begun. Sell your book all over the world! Your book will be available on Amazon.com and BarnesAndNoble.com! If your book has been assigned an ISBN, it is eligible to be sold in retail stores (both online and brick-and-mortar) and listed in Bowker's Books in Print, a massive, searchable, bibliographic database used by librarians and booksellers in the US and several other countries. Having your book appear in these venues certainly means it is possible for people around the world to find it, but is it likely? Is it likely people will simply stumble upon YOUR book among the millions of books out there? Sure, it's a thrill to show all your friends that your book is listed on Amazon, but who else is going to see your book there? Again, if you're an established, popular author, people may be looking for and buying your books on a regular basis. However, most authors need to publicize their books to prompt potential buyers to look for and purchase them. Even well-known authors embark on tours—interviews, signings, readings—when they release new works, and you also must participate in various events and other endeavors in order to promote your work and encourage people to buy. The statements above are not meant to discourage you. Their intention is to make you aware that traditional and self-publishers will provide various services to help promote and sell your book, but there is simply no substitute for YOUR involvement and effort in the process. You may have a great book that many people will love, but they won't look for or buy it if they don't know it exists. You will need to promote your book to get the word out. Traditional publishers will likely produce various promotional materials (e.g., bookmarks, mailings, catalog inclusion) as part of the publishing process. Many self-publishers also offer marketing services at an additional cost. You will more than likely wish to engage in promotional activities yourself regardless of whether your publisher performs any such services. If you're on a tight budget, try creating and producing materials—flyers, mailings, business cards— yourself. Make sure you keep a supply with you at all times so you can place them wherever and whenever you see an opportunity. Paid advertising is another option, but can be quite expensive. Make sure to explore your options carefully and consider just how many books an advertisement must sell just to pay for itself. Also consider your book's target audience. Are they more likely to read a newspaper, listen to the radio, or surf the Internet? You'll want to choose the most appropriate medium through which to promote your book. If you have a website, consider online advertising. Bid-based services, such as Google AdWords, have become quite popular and give you more control over cost and placement. Making personal appearances is an extremely important part of promoting your book. A traditional publisher may arrange events for you, but regardless of how you publish you, make sure to seek venues at which to appear with your book. Schedule signings at bookstores and libraries and watch for book fairs (and even flea markets, craft events, etc.) in your area. Seek venues—libraries, community halls, colleges—where you can give a PowerPoint presentation about your book. You may even receive a modest honorarium for doing so. Again, remember your book's target audience here. Try to travel to the areas and venues that members of your audience would likely visit. Having others say positive things about your book can also help in promoting your work. Don't simply blanket area newspapers with free books, though. Due to budget cuts, many newspapers are understaffed and may not even employ a qualified reviewer. However, they are still more than happy to accept a free copy of your book. There is usually no guarantee of a review when you submit your book, but you should at least contact prospective newspapers beforehand to see if a qualified reviewer is on staff. If you have any connections to people of respect and authority, use them! Ask that college professor or newspaper editor friend to write something about your book and then place his/her comments on the back of your book, on your website, etc. If you have a website or blog, post positive comments from friends and others who have read your book. You will likely have many options for distributing your book (i.e., placing your book in stores and other sales venues). The options that work best for you will depend on how much time you have to invest and how much profit you need or want to make. Most traditional publishers will take care of distribution for you, but they will also keep most of the sales proceeds. Self-publishers typically perform some basic tasks, such as listing your book on their websites and possibly on other websites with which they are affiliated, as well as in Bowker's Books in Print. You will likely take on more of the responsibility for distributing your book, but you will also keep all or most of the sales proceeds. Distributor's return policy: Many distributors allow stores to return books that don't sell in a given time (usually 30–90 days). In addition, the stores aren't normally required to ensure books are in mint condition in order to return them for a full refund. Distributor's shipping policies: You will likely have to pay to ship your books to the distributor. You may also have to pay for the distributor to ship returned books back to you. You may also decide to handle distribution yourself. If so, you will need to invest a fair amount of time persuading retailers to carry your book, as well as in shipping and transporting your books. You may also find it difficult to get your book in large chain stores because many will only work with a handful of distributors. If you have the time to spare, though, the profits you keep for yourself may well be worth it. If you use a traditional publisher or a distributor, you may still want to do some marketing and distribution on your own as long as your publisher/distributor allows you to do so. You will likely want to place your book in as many sales locations—bookstores, gift shops, pharmacies, online stores—as possible. Again, a traditional publisher or distributor may take care of this for you, but you will likely have little or no say in where your books are available. If this is the case, check the company's policies to see whether you are allowed to distribute and sell your book on your own as well. NOTE: If you do sell any books yourself, make sure you follow applicable rules and regulations regarding sales tax, income tax, and being a vendor. You can read more about vendor requirements in our Legal and Tax Requirements section. Bookstores and other retail outlets will expect to buy your book at a wholesale discount. They may even wish to return unsold books for a full refund, regardless of whether or not the books are damaged in any way. Different stores may have different terms and requirements. In general, larger chain stores will be less flexible than smaller stores. If you are handling sales yourself, you may want to target these smaller stores. You may even find they are willing to accept a lower discount. The best way to maximize profits is, of course, to sell your books directly to buyers at the full retail price. This cuts out the "middlemen" (e.g., distributors, stores). Unless you happen to own your own store, your best option for direct selling is your own website. If you have just one book to sell, a small website would be inexpensive to both design and maintain. If you have some web design knowledge, you can perform the work yourself; otherwise you should hire an experienced designer (not necessarily a large firm, though). Keep in mind that you will also have to plan how your customers will pay through your website (PayPal is a good option for small eCommerce sites) and you will need packaging materials and labels for shipping. This section is not intended as an exhaustive discussion on all legalities and tax ramifications involved in publishing and selling books. It is meant to advise you to explore state and federal requirements that may pertain to these activities. For instance, if you are a New York State resident and wish to sell books, you will need to file a DBA (Doing Business As) form with your county clerk's office and obtain a Sales Tax Vendor ID from the state. Once registered as a sales tax vendor, you will need to file periodic sales tax returns disclosing all sales, even those that are wholesale, tax exempt, or out-of-state. You will also be required to claim your sales income on your state and federal income tax returns. To avoid penalties, you may need to pay quarterly estimated state and federal income taxes. On the upside, you will likely be able to claim your business expenses (e.g., publishing costs, business mileage) as deductions. We recommend visiting the IRS website, your state's taxation department website (www.tax.ny.gov for New York State), or a knowledgeable business accountant for business tax information. If you are self-publishing, the self-publishing company may require that you have some sort of business tax identification number (e.g., the aforementioned NYS Sales Tax Vendor ID) in order to provide you with materials and services on a tax-free basis. In other words, if you do not have a tax ID, the company may charge sales tax on goods and services. Furthermore, do not take a company's failure to request your tax ID as confirmation that you are not required to have one. State and federal tax agencies do not deem ignorance as an excuse for not following rules and policies; you may face penalties and fines if you do not properly register and disclose your business activities and sales. If you are a New York State resident, we recommend that you visit the New York State Small Business Development Center website for information on starting a business. There are local and regional branches around the state where you can seek free help and advice on all sorts of business-related topics. Other states likely have similar agencies, and there is also a federal agency for small business information: the US Small Business Administration.